Jakarta Provincial Government commits to reduce greenhouse gas emissions by 30 percent in 2030.
" 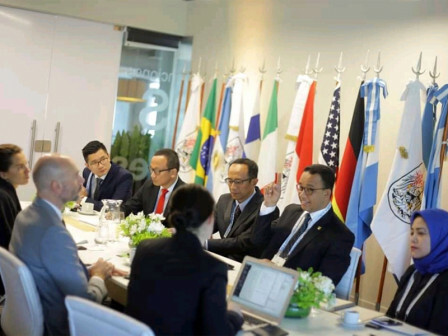 Jakarta is currently in the process of making a comprehensive Climate Action Plan"
It was conveyed by Jakarta Governor, Anies Baswedan during a meeting with Executive Director of C40 Cities Climate Leadership Mark Watts on the sidelines of Urban 20 (U20) Mayors Summit meeting, in Buenos Aires, Argentina. "Jakarta is currently in the process of making a comprehensive Climate Action Plan. It is targeted to be completed by 2020," he stated, as quoted by an official Facebook account, Tuesday (10/30). He stated that C40 is very interested in the innovation of Jak Lingko and offering Jakarta to utilize the Global Environment Facilities, thus there is funding that can be used to support integrated public transport system policies. The process of making the Jakarta Climate Action Plan is also carried out with C40. Additionally, there is also a C40 Academy that can be followed by the city regarding the planning and management of the transportation system. "We agree on various collaborations with C40 related to climate change initiatives, to preserve the earth that we borrow and we must return to our children and grandchildren in the future," he stressed. As for the information, C40 is the organization of 90 major cities in the world, representing more than 650 million inhabitants and a quarter of the strength of the global economy. This organization aims to encourage urban action to anticipate climate change, reduce greenhouse gas emissions, and improve the quality of health, welfare and economic equality of the citizens.